What does the passing of the current LAUSD budget for 09-10 mean to schools with a high percentage of new teachers? These teachers will be fired and replaced with demoted/displaced workers from Downtown headquarters and Local District offices. Per LAUSD policy, positions created by the firing of new teachers must be reserved for displaced workers. Even if schools are able to buy back positions with the increased Title 1 funding, those positions will be offered to displaced workers first. L.A. Academy has dozens of new teachers who will no longer be serving our students, arguably some of the least served students in society, come July 1st. Hello. 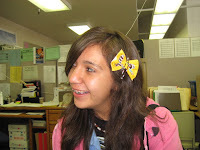 My name is Cindy Borunda and I am an eighth grader at Los Angeles Academy Middle School. I will start by saying this school has come a long way since I first started out in sixth grade. I have seen countless sessions of after school tutoring and enrichment programs organized by the teachers. I have seen teachers work countless hours after the school day to figure out what they are doing wrong when one of there students is having trouble understanding the lessons. These are people that care, these are the people we should proclaim heroes, but instead you are giving them indecent wages and laying them off. This is an injustice! Where did all the money from the Stimulus package go? Was the money spent on careless things instead of making an effort to make public education better? For those of you willing to sacrifice to save newer teachers, thank you. It will help save the jobs of teachers at L.A. Academy, such as Lamar Queen, the rapping math sensation. Right now, furloughs are one of the few solutions on the table. Very soon, it will also be necessary to finally address the issue of seniority, and/or how new teachers are assigned to schools. It is unconscionable that each time there are budget reductions, South Central gets hit the hardest. Richard Vladovic is one of the Board of Education representatives for South Central Los Angeles. At a recent board meeting he recused himself from voting on issuing pink slips to teachers because his son was pink-slipped, and he wanted to avoid a conflict of interest. Parents, students and educators in South Central want to know: who is fighting for our schools? 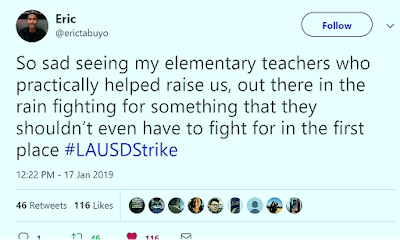 How can Vladovic be an effective advocate for students and schools in South Central L.A. if he abstains from voting on the issues that are pivotal to us? Now, more than ever, it is apparent that if we are to survive the upcoming cuts, leadership must arise from the people themselves, not from those in positions of power that we have trusted to protect our schools and our students. Osvaldo hands out flyers when he could be home in bed. Carita Spencer Bryant (left) has taught at this schools since it opened and does not want to see her newer colleagues go. Melissa Naponelli is UTLA Co-Chair and is fighting valiantly to help the new teachers. The Chimalpopoca family participated in the leafleting, even though Osvaldo, an 8th grader in our Advanced Studies program is off track and could have slept in. Joe Zeccola (left) and Brent Tercero have both been RIF'ed and are devastated. 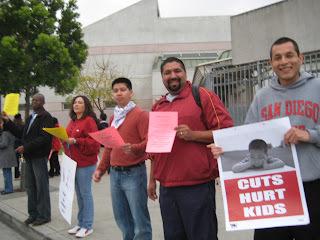 Mr. Kelley, Mr. D'Lugo and I joined Mr. Mata at the UTLA House of Representatives meeting last night (4-1-09), and I have to tell you, we were all surprised by what we saw. And what, you ask, was that? UTLA Representatives and Chapter Chairs ready to fight for our jobs! "As long as one teacher is in danger of losing his/her job, we cannot vote to approve this agreement!" "We will not vote yes on this contract while 4,000 of our brothers and sisters are in danger of losing their jobs!" "If we vote for this contract, not only will we be making it easier to lay off 4,000 mostly new teachers, but the next time, they'll be coming for the veteran teachers." These comments literally caused the room to ERUPT in applause. I am not exaggerating. Board members expressed serious concerns about making important budget decisions without accurate information from Sacramento, so they voted to delay decisionis until the next board meeting on April 14th. Superintendent Cortines made mention in an interview with NBC that he is tired of the Board making decisions based on getting "hundreds of emails convincing them to vote a certain way". Apparently all the phone calls and emails expressing our concerns have been heard by the Board. Readers have also encouraged the consideration of furlough days and/or pay cuts. Some have even said they would not mind paying a higher medical co-pay if it means saving jobs.